With all the new types of cards there are duration, reserve, night ect. Has anyone ever tried to upgrade them. To make them better. Woodcutter, thief, spy, adventurer, chancellor, and feast. Feast probably the worst. And great hall, secret chamber, tribute, saboteur, coppersmith and scout. Well great hall seems boring and scout doesn’t seem that great either. The other 4 seemed really cool yes saboteur didn’t have a benefit but neither did sea hag and that’s still being used on dominion online. Saboteur one of the strongest attacks ever made at least for 3 or 4 player game. As an attack card lover I always wanted to play with this card. In fact i never bought intrigue cause I’m still looking for the original intrigue. But that seems impossible now. For a card no one loved. No one is selling it. So I thought about tweaking the original removed 12 cards. Like giving saboteur a benefit. 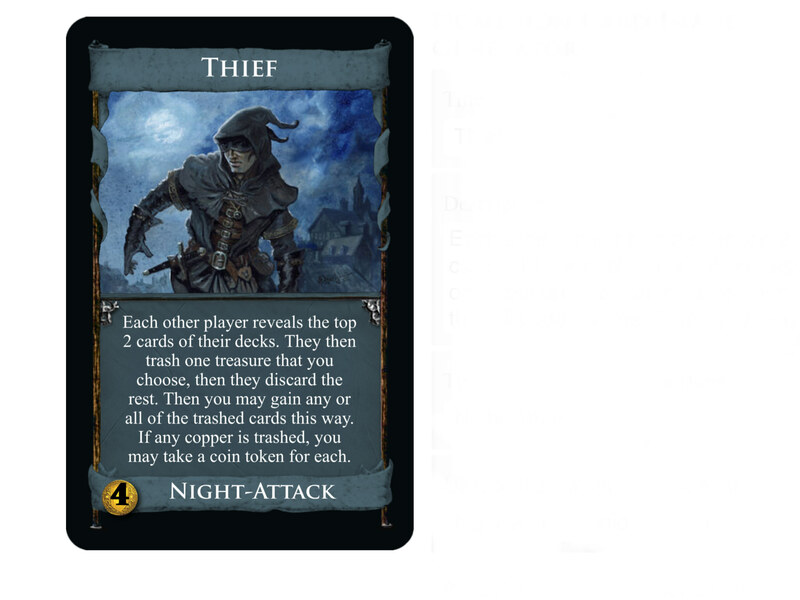 And changing thief into a night-attack. If I send a link to imgur would anyone like to see them. There have been a few threads discussing improving existing cards (this is the one I remember reading, and discusses most of the cards that were later removed). Most revisions threads have strived to change the cards as little as possible, keep to the spirit of the original design. I don't know that anyone has tried drastic changes. Some of the removed cards could be changed up, but I would argue many are redundant in the presence of the 2nd Editions and expansions, e.g. If you do make any new versions, this is the right place to share them, and people would gladly give feedback! 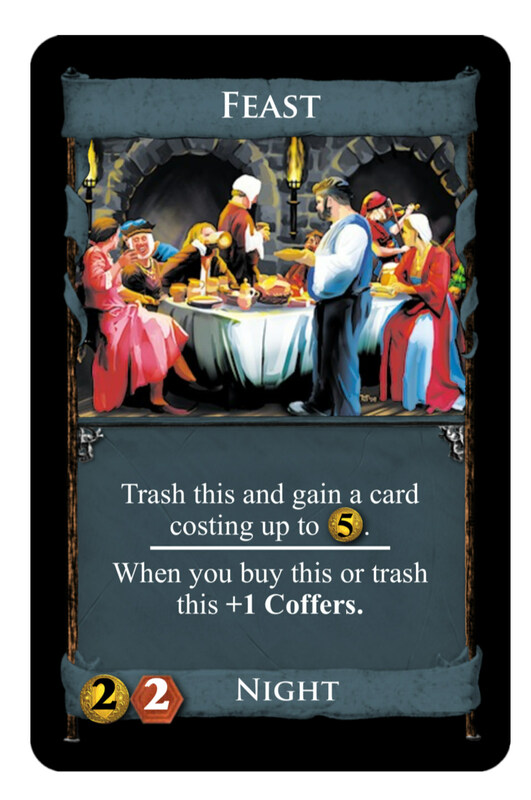 Glutton (Feast Upgrade): Plays essentially the same early game, but late game it can be a great $5 cost gainer. Have never tested this, so it may be too strong. 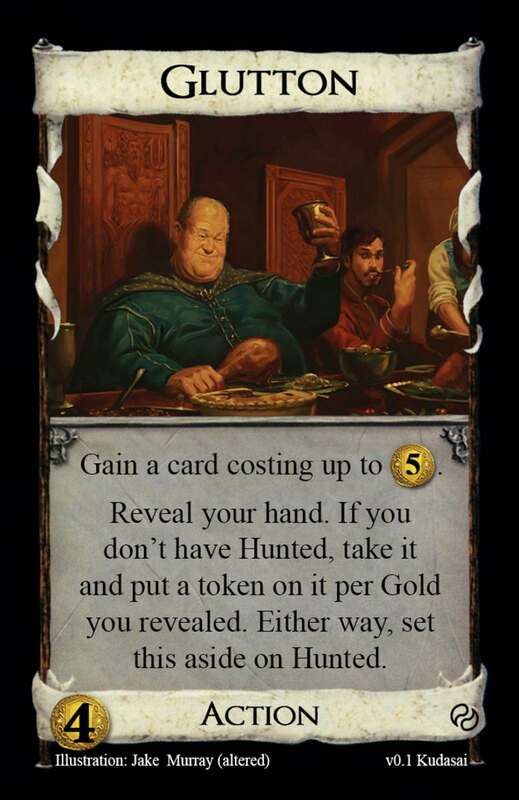 Includes the state Hunted, which just plays a card X amount of times (in this case, it plays Glutton once per turn for each Gold you revealed). Lumber Camp (Woodcutter Upgrade): Identical to Woodcutter, but now if this is one of your first two gains, they become permanently cheaper by $1 coin. A very small change, but I think it makes it a lot more interesting. Woodcutter on it's own was fine power wise, so I couldn't buff this too much. Adventurers (Adventurer Upgrade): This now draws stronger and stronger Treasure cards each play until it stops functioning. 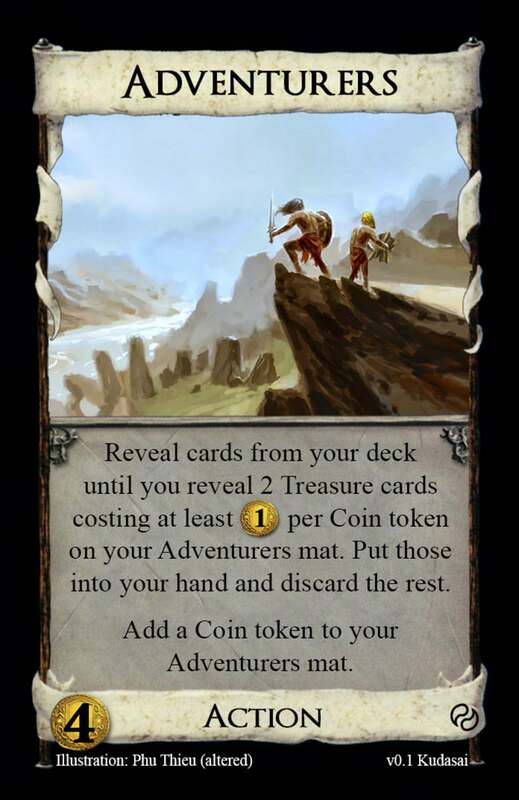 I personally don't thing pure, Treasure drawing works well as a concept, but I do think this version is a lot more fun. These may not be great cards, but they were sure fun to make. What cards have you come up with? Well here’s the first one. My device doesn’t seem to let me put anything but the link to the photo. But it’s better than the way I use to have to do it. Feel free to post the images from imgur yourselves. I know it says coin token. I can always change it to coffers later anyway. Maybe put the text of the card? It's easier to quote and stuff that way. This is the new improved feast. It’s a night card. So you don’t have to waste an action playing. Well it’s still a victory that has the same victory points. Once again its another night too. However the fact that you might be able to keep all the weak victory point cards out of your deck almost all the time might be worth it. Well you will have to reshuffle twice as often. But at least you get a couple of villagers too. 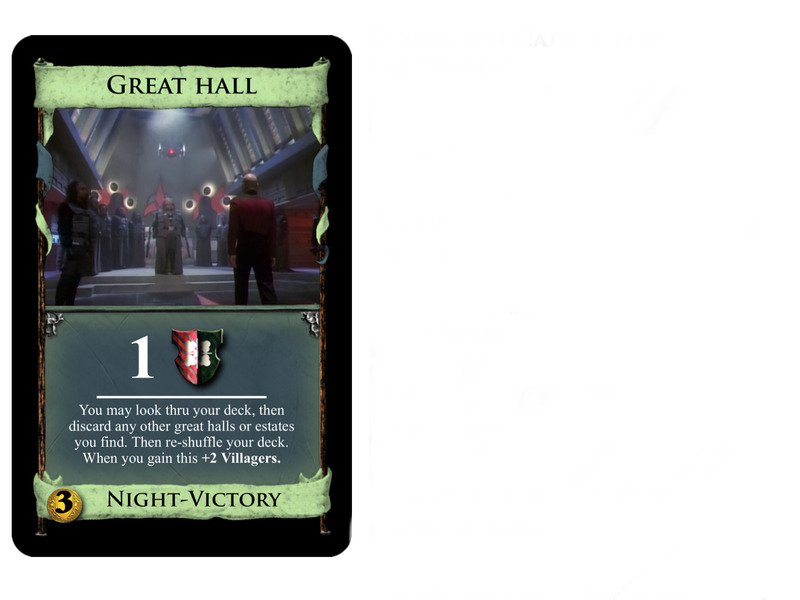 Sorry for the picture I couldn’t find the original artwork for great hall. And I like Star Trek. This doesn't need Debt costs unless you explicitly want to enable getting two Feasts in the opening. Also note that this is now ungainable via Workshop variants. Workshop-Feast-5 was slow but it was sometimes a thing, e.g. to kick off a Festival-Library engine. I think that Feast can get away with being non-terminal but the 2 Coffers are too much. Feast was weak so it needs a slight buff but its main issue was that it was boring. Great Hall already got buffed and is now called Mill. Anyway, fishing out some green is OK and a neat way to emulate the card draw that Great Hall had and you card doesn't have (directly). This sifting variation is an idea which is worthwhile to explore. The Villagers feel pretty random though. Look through your deck. You may discard any number of Victory cards (and Curses? ), revealed. Shuffle your deck. The main thing to keep in mind when doing fan edits to these is that they weren't just eliminated for being too weak - often they were too boring (Great Hall), slowed the game down too much (Spy), or they were just sorta pointless (Feast). A lot of this design space was explored in the replacement cards, and the rest I don't particularly miss. So if your design approach is "the old card, but with some new, more complicated stuff", you're not really improving them. 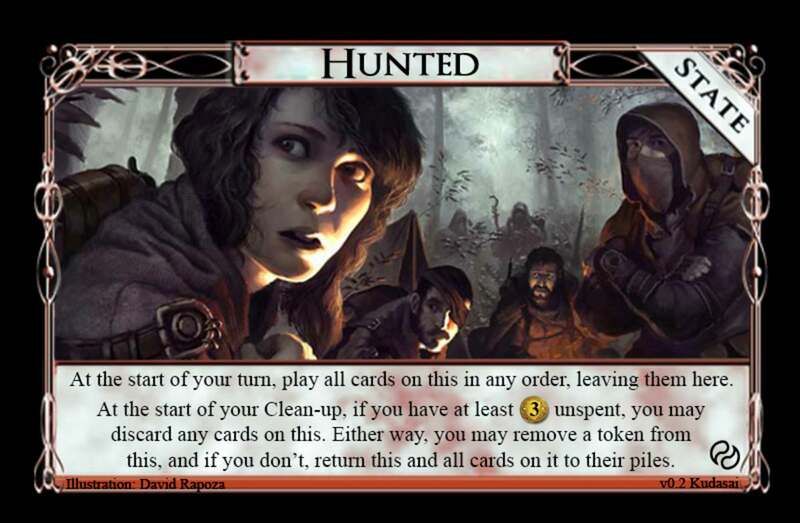 I mostly just doing this for intrigue’s old cards. I can’t find them anywhere. To buy I mean. I really want saboteur, tribute and secret chamber. Like I said I can’t find those cards anywhere. I see people selling spy, thief, woodcutter for instance but why can’t I find the 3 I want. If there really such boring cards or useless cards to play, why doesn’t anyone want to sell them. And the original intrigue box only one is being sold for 100 dollars or so. So I thought why not just recreate them as fan based cards. So I might as well tweak them in the process. Do you guys have any ideas for the ones I have already put out. So there not so boring as you guys say they are. Hmmm. Interesting limetime. So does that mean even if copper was trashed you still get a benefit? I don't think that this is bad but it is slightly better than Mill as there are more situations in which you want a village than a DoubleOasis. 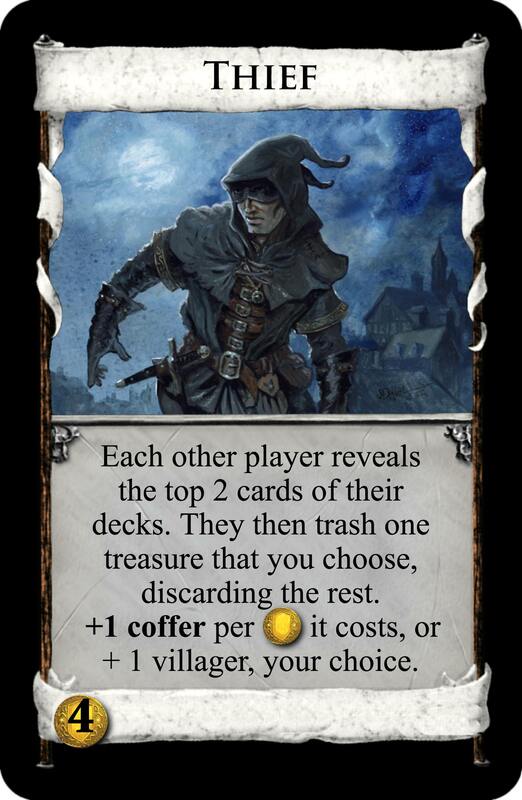 It is also less interesting than Mill, a card which does something on-play which no other Kingdom card does.